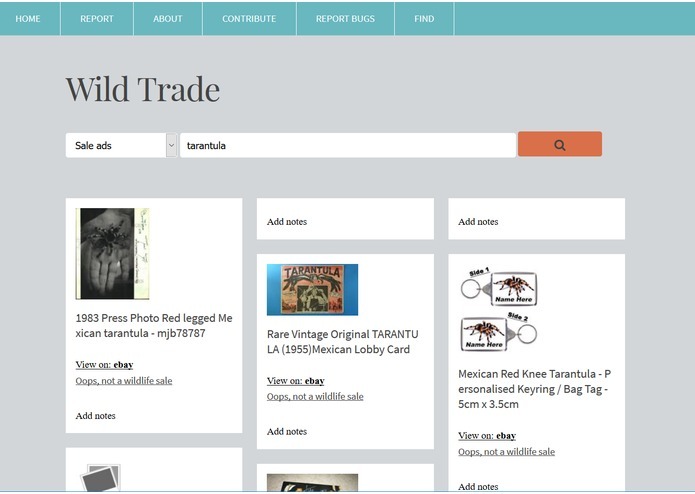 An API that gathers relevant data from social channels to tackle illegal wildlife trade. We were tasked to quantify the scale of illegal wildlife trading. We responded to problem statements 3 (our solution is an API) and 4 (our solution built a use case for illegal trade in spiders using this API). We built an API with a database that aggregates and stores sale posts from different social platforms (currently Gumtree, Twitter and Ebay). It will be customisable to different audiences (eg. law enforcement, conservationists, researchers, policy officers). 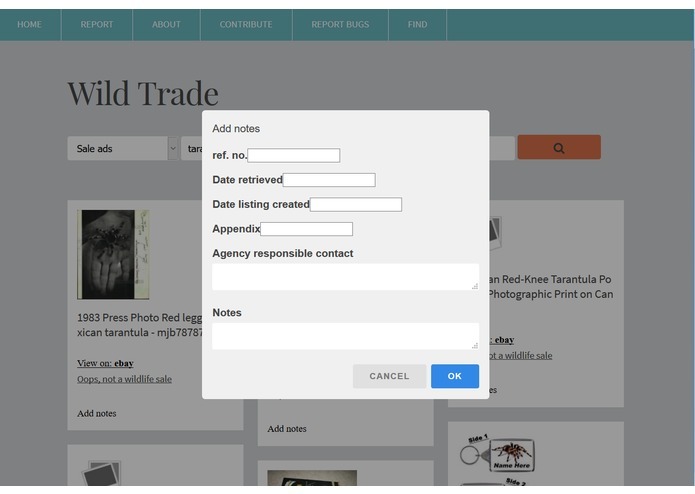 To facilitate collaboration between different parties, users can add notes to the entries to share knowledge and help build a case on a sale or a trader. A website with a simple and intuitive user interface that gives all the essential information at a glance. It works across desktop, tablets, smartphones. Challenges we ran into The first challenge was trying to break the complex multi-actor problem into something soluble. When the Ebay API returned without a picture, we passed 'undefined' as a parameter. This led to an unfulfilled promise error. This led We dealt with this edge-case by setting a sensible default (an empty string). What we learned In particular, I learned more about relational and non-relational databases and how and when to use each type of db. Meet with spider expert from London Zoo about how we might develop it further for this use case.